RAJKOT: Gujarat’s pride and its prey are both facing a fast invading foe. Two shrubs — lantana camara and cassia tora — spreading in the Gir forest are threatening to drive out not only the Asiatic lions but large number of herbivorous animals like deers too. 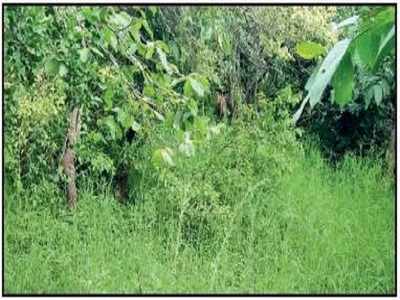 Experts and forest department officials said that the spread of lantana camara (locally known as indradhanu) is so rapid that removing them is proving to be a Herculean task. The problem of these ‘obnoxious weeds’ is not new and has been observed for nearly two decades now. But the failure to nip them in the bud is now threatening to hurt Gir ecosystem. The thorny lantana and cassia tora (locally known as kaalmukho) stop the growing of grass and other shrubs that the herbivorous feed on. As a result, large swathes of land in the national park and sanctuary have very little grass. The deers, nil gai, black bucks and other herbivorous animals don’t eat plants of either of these shrubs. The longterm impact is the potential danger of lions moving out in revenue areas in search of prey, thus increasing chances of human-animal conflict. A forest official said that lions usually like open spaces but in several ranges these are also depleting due to thick vegetation of lantana. The uninhibited spread, much akin to gando baval (prosopis juliflora), could also threaten existence of trees like caria, oak and karanj, which are essential for wild animals. Lions often take shelter in the coppice of caria trees, especially in summer. When these herbivores animals won’t get food, they won’t survive and if they won’t survive, it will be difficult for lions to get food. The entire ecosystem will be damaged,” he said. Cassia tora is another plant of the legume family that renders the land nonfertile by not allowing grass to grow.